ROCKFORD---The Gladstone High School baseball team lost twice downstate in Saturday. The Braves lost to Rockford 11-6 and to Grand Rapids Catholic Central 9-6. Against Rockford, Gladstone took a 2-0 lead in the first inning when Cody Frappier doubled home Caden Alworden, and a wild pitch scored the second run. But the Rams came right back against Braves starting pitcher Carson Shea with two runs in the bottom of the inning, and then added two more runs in the bottom of the third inning. In the top of the fourth inning, Ian Schwalbach scored on an error to cut the deficit to 4-3, but Rockford put three more runs on the board in the bottom of the fourth. That was all for Shea on the mound, as he gave up seven runs (five earned) on eight his and three walks in four innings of work. Drake Forrest came on to pitch the fifth and sixth innings and was charged iwth four earned runs on five hits. Gladstone's final two runs came in the top of the sixth as Cooper Cavadeas was hit by a pitch, Doby Gillis doubled him to third, and then Cavedas scored on an error. Zach Hanson singled home Gillis to bring home Gladstone's final run. Dan Martin had two hits in a losing effort. 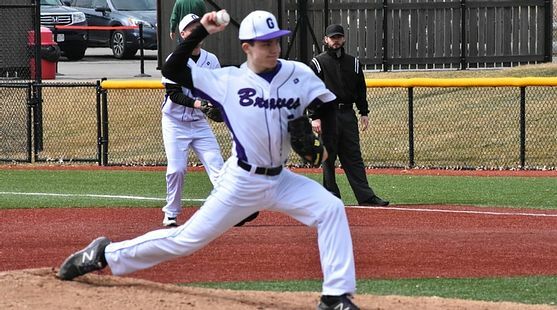 Against Catholic Central, Jared Crow retired the Crusaders in the first inning, and then the Braves scored twice in the bottom of the inning on a Frappier RBI double and an RBI single by Gillis. Catholic Central scored single runs in the second and third innings to tie it at 2-2, and then the Crusaders chased Crow off the mound with a big fourth inning. In all, GRCC scored four runs in that inning as Hanson came in to pitch. Crow ended up allowing six runs (fove earmed) on five hits and five walks in 3 1/3 innings. In the bottom of the fifth, however, the Braves bagttled back. Christian Creten singled, and then Forrest was safe on an error, with runner Cole Hansen advancing to third. Shea singled home Hansen to make it 6-3, then an error and passed ball scored two more runs. But Frappier and Ben Kelly both struck out to end the threat. In the top of the sixth, Catholic Central got all three of those runs back to take a 9-5 lead. Hanson ended up allowing three runs on four hits and a walk in 2 2/3 innings. Gladstone scored its final run in the bottom of the seventh as Shea led off with a single and scored on a single by Martin. But the Braves could get no closer. Shea had three hits and scored three runs in a losing effort. Gladstone, after opening the season with three wins last weekend, fell to 3-2. The Braves are scheduled to travel to Menominee for a doubleheader on Thursday, with the first pitch set for 5:00 ET. The games will be broadcast on NewsTalk 600 and rrnsports.com.